I remember the days when I was in grade school and my best friend at the time and I would go to her house after school, run upstairs to her room, and pull out some of our collection of cassette tapes of our favorite audio series. We’d spend hours upon hours in front of her boombox captivated by the adventures, built up spiritually by the moral characters, and knit together as friends in our beneficial pastimes. Listen to some samples of the stories by clicking here! 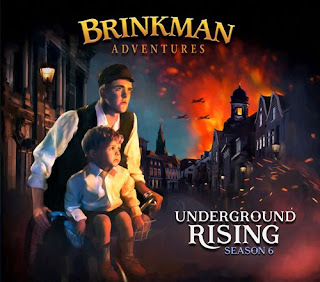 You can imagine my excitment when my family got word that we were reviewing Brinkman Adventures Season 6: Underground Rising, Digital Version! We had never heard any of the Brinkman Adventure’s audio dramas before, but we are audio book junkies! AND we just got a new 15-passenger van that has a CD player! AND we had a road trip at our finger tips! We were so excited to pile in the van and be transported back in time to WWII Holland where we learned about the Brinkman’s great-grandparents and the heroic measures they took to save the Jews from the persecution they were facing in the first few episodes. We then were encouraged with the gospel message in “Twice Born Fly” and in knowing that when we have salvation in Jesus we don’t need to fear anything… even death! “I Wonder Why?” gave us hope that even terrible circumstances we face, such as a miscarriage, can be used for good and God’s glory when we walk in faith and obedience to His will. “Free Burma Rangers” was my husbands favorite story on this album. 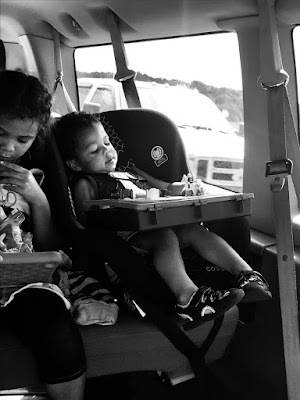 He kept telling the kids to “shhhhhh” so he could engage in the story surrounding us in the car :). This story followed a boy through his young life and adult life and the wrestle over what God’s will was for his life; what was his calling? Brinkman Adventure Season 6 Underground Rising includes 2 CDs each comprising of 3 tracks. Episode 58 I Wonder Why? Evelyn contently sucked her thumb while we listened to Brinkman Adventure. Things got a little loud at times, but I think she enjoyed it. A group of young boys were brainstorming ways to provide food stipends to the people that weren’t able to get any. Their plan was to ask church members to leave their food cards in the pockets of jackets at church so that these boys could go from pocket to pocket and “steal” the food cards. These cards would then be distributed to the less fortunate and the card owners could file them as “stolen” and get new ones issued to them. My kids were perplexed as to why they would steal! In what situation would it ever be acceptable to do this? I greatly appreciated at the end of “I Wonder Why?” there was a disclaimer for kids to be careful not to eat food they’re allergic to without having a parent with them. You see the little boy in this story had severe food allergies causing him to have anaphylaxis. Later in the episode he believed that God healed him. So he began to eat some wheat and it was a tear-jerking reality (Yes I teared up…) that God did indeed heal him. The disclaimer explains to kids that healing is a topic that is sometimes hard to understand and encourages young listeners to inquire on this topic with their parents. I appreciated that the creators of this series didn’t attempt to teach my children any Biblical topics that can be “touchy subjects” but instead reverted to the parents for doctrinal issues. The stories on Season 6 Underground Rising were pretty intense and dealt with some heavy topics. I loved this about them! They weren’t just happy-go-lucky episodes without any real life changing, faith challenging situations or topics. They were real. I appreciated this. We have listened to each of these audio stories 2-3 times each and they never get old. In fact, every time we get into the car we are excited to be able to listen to them again.